Since today is officially the last day of summer, I wanted to share with you one of my favorite dresses. When it comes to clothing, I love looking for the hidden gems. 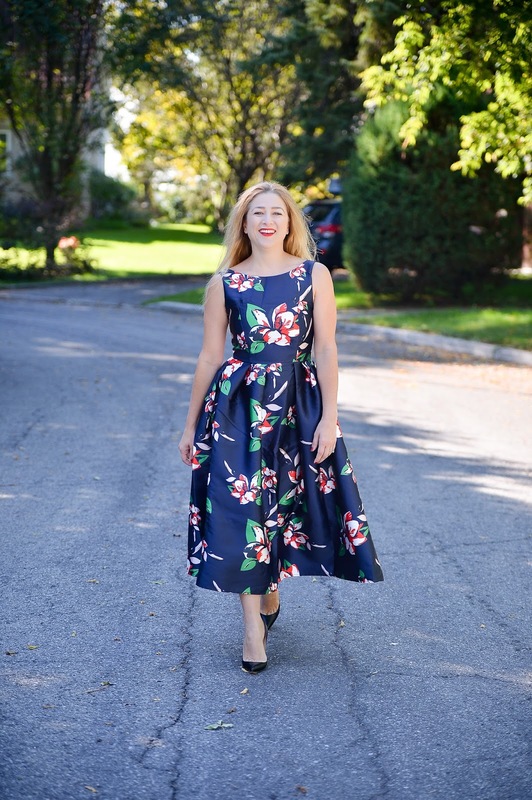 I ordered this dress online from Chicwish for under $60 and wore it several times already. I've lost count on how many compliments I've received on this dress. It is so comfortable that I'm thinking of getting it in other colors. This dress (if you're looking for one) is definitely a great purchase. I promise you're going to have a smile on your face whenever you wear it. I love that dress I have one very similar from chicwish and its the best!! The dress looks stunning and the shoes are wonderful too. I like the flowers, is romantic as you described it. Very nice. What an incredible dress! I love everything about it. The fullness and extravagence of it, the deep blue colour and the luscious texture. I like how the flowers are large as well. You look fantastic. LOVE this look! That dress is fabulous and I love the Pigalles!! I have them too (although they look GORGEOUS I can't wear them all night ;) Haha.) You look amazing. Thanks for linking up with us today! I'm not surprised you get compliments on it, that dress is gorgeous on you! I love the print and full silhouette! Great dress. Those colors are amazing on you! Stunning! The color, the silhouette, the fluidity - perfection! Love your style and always look forward to stopping by! What a beautiful statement dress! The fit is perfect. The shape and print of this dress are absolutely beautiful! Beautiful Crissy, I love the print of the dress. Gorgeous dress!!!! I love that print! It has such a luxe vibe to it. This dress is gorgeous! I love the print and the longer length! I love this dress on you!! I have been tempted to order things from Chicwish, they seem to have so many pretty prints.